Platte Farm Open Space is a resident led, brownfield to open-space project in Globeville. Upon completion, Platte Farm Open Space will be an unique and important example of how to re-purpose formerly contaminated land for community benefit. The 5.5 acre brownfields site will feature restored short-grass prairie, crusher fines trails, and a play space. The impetus for creating Platte Farm Open Space was persistent and illegal dumping, drug dealing, and general neglect of the site. In the eyes of residents they could either work to activate the site or it would continue to be a dumping ground. PFOS will provide an opportunity for Globeville residents to recreate and reconnect with nature in a neighborhood that is surrounded by industry. The site plan for Platte Farm Open Space details the land area and amenities to be included. 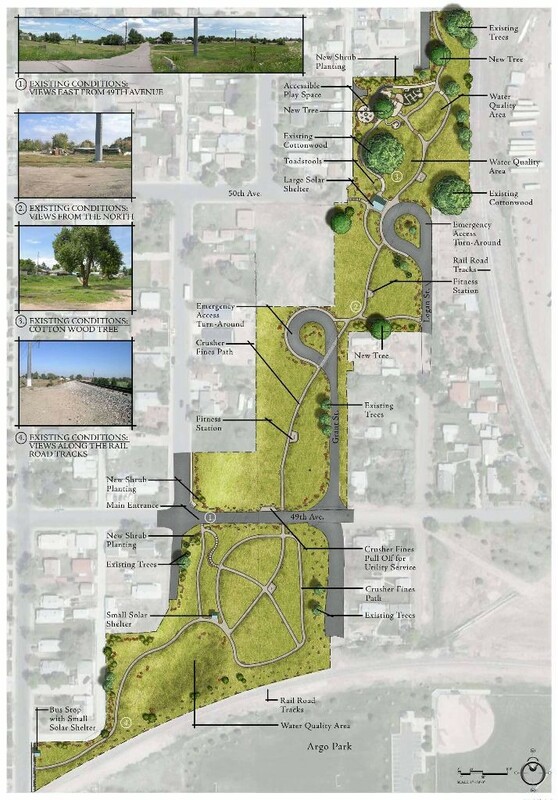 At the request of residents and the Globeville Civic Association #1, Groundwork Denver became involved with the visioning, planning and implementation process for the project. Groundwork Denver has been acting as liaison between the Platte Farm Open Space steering committee, property owners, and Denver’s Department of Parks and Recreation. Throughout the years we have secured funding on behalf of the Globeville neighborhood to continue planning for Platte Farm Open Space. Landscape architects have helped transfer the neighborhood’s vision onto paper, environmental consultants and survey experts have helped us conduct our due diligence with regard to the many parcels of land that make up the open space and hundreds of signatures from neighbors, businesses and schools have been collected in support of implementing Platte Farm Open Space. With this project residents are saying “no” to crime and “yes” to sustainable land uses. Platte Farm Open Space will solve multiple urban issues: an overwhelmed storm water system, blight, crime, and limited access to natural open space. To learn more about the Platte Farm Open Space, contact tangier@groundworkcolorado.org.